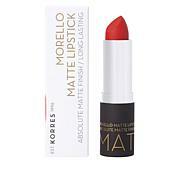 Pencil-style lipsticks for intense, glossy color. 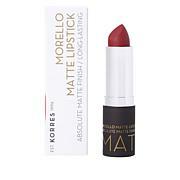 All-in-one and enriched with raspberry oil, these lipsticks help moisturize lips while offering full, shiny, long-lasting color. 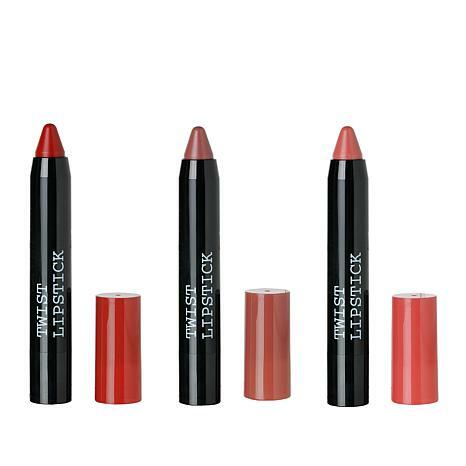 The twist-up pencil, ideal for an easy and extremely soft application, delivers ultimate precision. Ingredients: Hydrogenated Polyisobutene, Bis-Diglyceryl Polyacyladipate-2, Bis-Behenyl/Isostearyl/Phytosteryl Dimer Dilinoleyl Dimer Dilinoleate, Squalane, Polyethylene, Caprylic/Capric Triglyceride, Triisostearin, Diisostearyl Malate, Microcrystalline Wax, Trimethylolpropane Triethylhexanoate, Pentaerythrityl Tetraethylhexanoate, Polyamide-3, Mica, Disteardimonium Hectorite, Flavor, Propylene Carbonate, Pentaerythrityl Tetra-Di-T-Butyl Hydroxyhydrocinnamate, Rubus Idaeus (Raspberry) Seed Oil, Tin Oxide, Calcium Aluminum Borosilicate, Synthetic Fluorphlogopite, Calcium Sodium Borosilicate, Linalool, Tocopherol, [+/- (May Contain): Titanium Dioxide, Iron Oxides, Red 7 Lake, Yellow 6 Lake, Yellow 5 Lake, Red 22 Lake, Blue 1 Lake]. Ingredients: Hydrogenated Polyisobutene, Bis-Diglyceryl Polyacyladipate-2, Bis-Behenyl/Isostearyl/Phytosteryl Dimer Dilinoleyl Dimer Dilinoleate, Squalane, Polyethylene, Caprylic/Capric Triglyceride, Triisostearin, Diisostearyl Malate, Microcrystalline Wax, Titanium Dioxide, Trimethylolpropane Triethylhexanoate, Pentaerythrityl Tetraethylhexanoate, Iron Oxides, Red 7 Lake, Polyamide-3, Disteardimonium Hectorite, Mica, Yellow 6 Lake, Calcium Aluminum Borosilicate, Yellow 5 Lake, Flavor, Propylene Carbonate, Pentaerythrityl Tetra-Di-T-Butyl Hydroxyhydrocinnamate, Silica, Rubus Idaeus (Raspberry) Seed Oil, Tin Oxide, Synthetic Fluorphlogopite, Calcium Sodium Borosilicate, Linalool, Tocopherol. Ingredients: Hydrogenated Polyisobutene, Bis-Diglyceryl Polyacyladipate-2, Squalane, Bis-Behenyl/Isostearyl/Phytosteryl Dimer Dilinoleyl Dimer Dilinoleate, Polyethylene, Caprylic/Capric Triglyceride, Triisostearin, Diisostearyl Malate, Microcrystalline Wax, Trimethylolpropane Triethylhexanoate, Pentaerythrityl Tetraethylhexanoate, Polyamide-3, Disteardimonium Hectorite, Flavor, Propylene Carbonate, Pentaerythrityl Tetra-Di-T-Butyl Hydroxyhydrocinnamate, Rubus Idaeus (Raspberry) Seed Oil, Tocopherol, Mica, Tin Oxide, Calcium Aluminum Borosilicate, Synthetic Fluorphlogopite, Calcium Sodium Borosilicate, Linalool, [+/- (May Contain) Titanium Dioxide, Red 22 Lake, Red 30 Lake, Yellow 5 Lake, Red 6, Red 28 Lake, Red 7 Lake]. I returned this because the shades are much brighter than they appeared on TV. I was anxious to receive the trio but when I applied, there is hardly any color on my lips. Don't know if I will keep or not.